at (707) 291-2967 or e-mail greg.fogg@comcast.net if you're interested. Please email Hank Lawson your mailing address so that he can send you your certificate if you were selected for the team. On Thursday, December 11th, I was accepted into Brown University. I will be attending the school and running for the team beginning in the fall of 2009. While my athletic abilities have blossomed in the last year, my desire to attend Brown has remained constant since I was a freshman. My choice was based on taking all of my interests to a higher educational level including my passion for history and the arts. I knew that a Division One school was the best place for me, and Brown was the only school where I could pursue all of my interests. 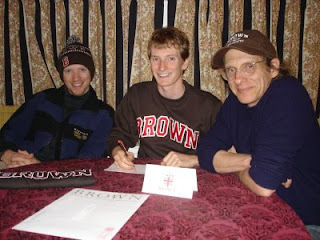 That being said, I will remain completely committed to the Brown Cross Country and Track teams. I have complete faith in the coaching staff, and I am sure that they will help me to reach my full potential. It was a shame that I was not able to show the coaches, and the greater public what I was capable of at NCS and State. However, now that the stress of applying to college is behind me, I can focus on the up and coming track season as well as my school work. I wish everyone the best of luck this season! Go Brown Bears! If any other athletes would like to announce where they are going to college next year, please email me a little about your choice and why along with a picture of yourself to albertjcaruana@gmail.com. Today we chat with one of the best track athletes in California history, current Texas A &M and former Mt. Pleasant student, Vashti Thomas. 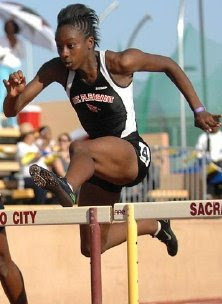 She finished off her high school career last year with victories at the California state meet in the 100m. hurdles (13.44), long jump (20'0 1/4") and triple jump (42'0 1/4") as she led Mt. Pleasant to a 2nd place finish in the team race. During her junior season, Vashti helped lead the Mt. Pleasant team to the state championship with her placings in the long jump and triple jump and her victory in the 100m. hurdles in an amazing 13.03! 1) How did you started in Track and Field? I just heard that my Jr. High was going to have a track team so I tried out. 2) What events did you start with as a 9th grader? Freshman yr. I started with the 100HH., high jump and the long jump. 3) When you first started in the sport, what athletes did you look up to as role models? I didn't really look up to anyone. I didn't really pay that much attention to track at the time. It was just some thing I did at the time but I didn't think I would be any good. 4) When did you first realize that you could be pretty good in track? I first realized that I was going to to be pretty good my sophomore year, but even then I didn't feel like I was good. 5) Tell us a little about your coaches in high school and what they meant to your development as an athlete. Nelson (Head coach Steve Nelson). was the one who found me and put the thought of doing the hurdles in my head. Angela (Hurdle coach Angela Hill). She was my hurdle coach and my psychiatrist. Not only would she help me improve as a hurdler, she would help me with any issue that was bothering me. Jamal & Jimmy (Jumps coaches Jamal Elmidge and Jimmy Brown). Jamal introduced me to the triple jump. The way they made practice fun just made me want to be out there so that i wouldn't miss out on the funny stuff. 6) Looking back at your high school career, what do you feel was your best race? best accomplishment? favorite moment? My best accomplishment was when I won the 100HH at the state meet my Jr. Year, I felt like all the blood sweat n tears I put in to track had finally paid off. My favorite moment actually was not on the track, it was when Jeneba,Stella, Deirdra, Marshay, and I were in New York for indoor nationals my sophomore year and we were eating at this pizza place and I forgot what we were laughing about but in that moment I felt like I couldn't be happier. 7) What were some of your favorite meets to attend in high school? Some of my favorite meets to attend were the Indoor Nationals in NY, not only because I liked the track and there is this graffiti gallery called 5 Points that I would see on the way to the track..lol My other favorite meet to go to was the Stanford Invitational. Although there would be caterpillars hanging from all the trees, I liked watching the college women run. 8) How did you end up choosing Texas A & M and what other colleges did you look at? I chose Texas A&M because, although i didn't take all my trips, when I went there I felt like I was at home and I wanted to be apart of the Aggie Family. I was looking at USC and LSU and many others but I'm not sure the thought didn't click. 9) If you could give advice to students who are having a difficult time choosing a college, what would that be? I would tell them that they should look at which school is offering the most. Check out the schools academics and make sure that they offer the classes that the athlete would want to take. Ask about the workouts and how their program works. Narrow it down to five schools. Take all their trips and the college that is best for them will let them know. 10) What has college life been like so far as a student and athlete? The college life so far has been great once you get past the homesickness. The way my schedule is set up is that I stay busy but I like it. Although sometimes I rather sleep than practice, its nice to have everything planned out. 11) What are some of your goals for this year and beyond? My goals this year is just to do better than last year. My future goals are to hopefully go to the next Olympics in at least two events. Hopefully you all received for everything you asked for this year. Today we chat with the leading returning thrower to CCS competition this coming season, Santa Theresa's junior, Meagan McKee. At CCS last year, Meagan finished in 2nd place (40'8") in the shot and 4th place in the discus (122'2") behind all recently graduated athletes. 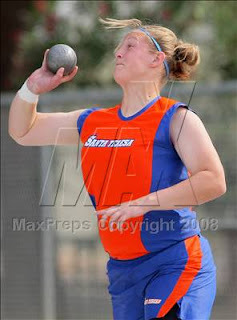 She is coached by her dad Ronald who is no stranger to the sport and many of the top throwers in U.S. history. 1) How did you get your start in throwing the shot and discus? I actually started throwing in the 7th grade, but I've always been around it. My dad has competed in the Scottish Highland Games for as long as I can remember. I was always at the meets and any other track and field competition he was in. Throwing seemed like a family business haha. 2) Tell us a little about your dad and some of his accomplishments in the sport? My dad, Ronald McKee, threw for Camden High School in San Jose, Ca. He was pretty successful, and won CCS his senior year in the shot put. He went to San Jose City College for 2 years and then transfered to Cal State Northridge on scholarship. In 1988 he competed in the Olympic Trials, and I believe he was 10th. Now he throws for fun but is going to try to compete for the Master's Championships. 3) As you were first starting in the sport, who were athletes that you looked upto and/or motivated you to improve? Of course there was my dad as a huge inspiration. I was always surrounded with throwers in general. I've met many throwers such as, Al Feuerbach, Mac Wilkins, Wolfgang Schimdt, Jay Sylvester, and many others. 4) What other sports have you done besides track and field? I played pop warner football for 5 years. I was starting guard, and played some defensive end and linebacker. Sophomore year in high school I played on the JV team as starting guard. I decided not to play the rest of the time in high school because my goal this year is to medal at state, and I didn't want to get an injury. 5) What does a typical week look like for you during track in terms of how often do you throw and are in the weight room? A typical week is throwing almost everyday. Whether it be both the shot put and the discus or just one a day. I'm in the weight room probably 2-3 times a week. One day I'll do squats, powercleans, and some abs. The other day I'll do benches, snatches, and trunk twists. On both days, I'll do discus flys with 5lb dumb bells. 6) Looking back at your past track season, what do you feel was your best performance? I feel that my best performance was probably at CCS. You only get 3 throws, and then the best 8 girls get another 3 throws. I almost fouled myself out of the trial part, but I got it back together and ended up getting second with a PR of 40'8". 7) Who will be your toughest competition this coming season in the shot and discus in CCS? In CCS, my biggest competition will probably be one of my good friends Michelle Chung, from Cupertino in the discus and maybe the shot too. But remember, there is always a surprising new competitor every year so we'll just have to wait. 8) As you look ahead to this coming season, what are some of your goals? My goal is to obviously medal in state. As for marks, I'd like to reach 46'-47' for the shot, and about 145'-150' in the discus. If they go farther, then I would gladly accept them. 9) At a track meet, what do you for your warmup? Do you prefer throwing the discus first or shot? My warm ups consist of running a little bit, and stretching. I don't stretch so much that my elasticity is gone, but enough that I won't hurt myself. I prefer to throw the discus first, but it's not that big of a deal. 10) What would your advise be for somebody new to throwing the shot and discus? You have to have dedication for this sport. Most of the season is concentrated on actually learning how to throw, and to sharpen your coordination. Be confident, and stay with it if you know it's something you want to do. 11) What are the meets you are most looking forward to this coming season? I love the Arcadia meet in April! The atmosphere is so exciting, it's like a state meet before it happens. A lot of the competitors at Arcadia are going to be the same ones at the state meet. It gives you a look at what you're up against. Thank you for asking me to fill out these questions, and I hope you have success in your track season. Maybe I'll see you at CCS! The post season awards have continued to roll in and the Marin Independent Journal is next with their runners of the year, juniors Erik Olson of Novato and Theresa Devine of Marin Catholic. The following clip didn't make the final cut of the documentary The Long Green Line but it's great nonetheless. It's Dr. Joe Vigil addressing the York HS team and giving them an important message. I could listen to Dr. Vigil talk all day. If you don't have a copy of The Long Green Line yet, it's a must for your library. This sounds like a great clinic this Saturday at Mt. Pleasant HS with some of the best sprint coaches in the state. Check out the link below for the clinic information. There will be a speed, strength & power Clinic on Dec 20, 08 at Mt. Pleasant High School in San Jose. This clinic is designed to assist athletes and coaches involved in speed and power sports to develop their maximum potential. The clinic is designed around track & field but will teach athletes and coaches important concepts needed to become faster, stronger & more elastic. Power lifting, plyometrics, bounding & throwing will be taught and athletes and coaches will participate in all aspects of the clinic. Clinic will be taught by many of the South Bay High School track coaches and will run from 9:00 am - 12:30 pm. Fee $25.00. *Due to an error in the listing of Lisa's grade by the coaches compiling the All-County team, Claudia Barnett was incorrectly listed in the Mercury-News as the Junior of the Year. 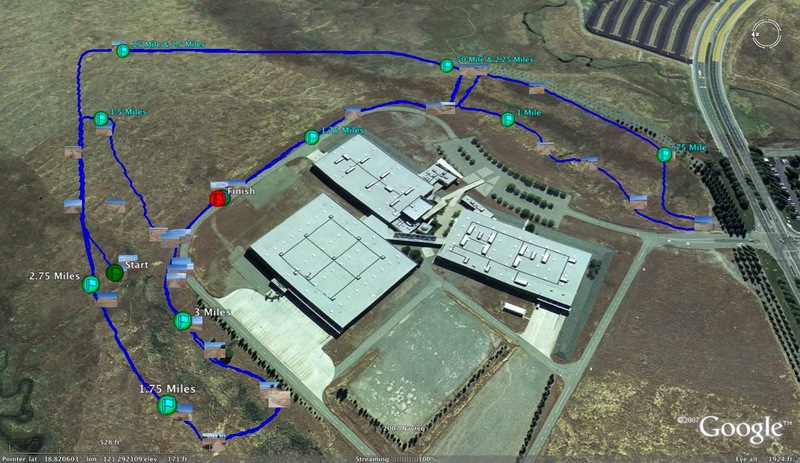 What coaches will be at the 1st Annual NorCal Distance Coaches Collaborative Round Table? UPDATE: We have reached the maximum of 60 and the Round Table is now CLOSED! Please continue to turn in your "entrance fee" to Chris. We look forward to a great event. The following coaches are either attending or have shown interest in attending the 1st Annual NorCal Distance Coaches Collaborative Round Table. If you have not done so already, please email Chris Puppione (cvpuppione@yahoo.com) to reserve your spot at this great event. If you would still like to attend this event, email Chris ASAP. If you are already on the list and know of other coaches who you would really like to see at the Round Table, please forward the following information to them. Elia Trujillo unexpectedly passed away on Tuesday, December 9th, 2008. She is survived by her husband Jose and their four children Temo, Israel, Enoch, and Jovita. All three of the boys are alumni of North Monterey County. Temo is currently a teacher and a coach at the school and Jovita is a current student-athlete on the cross country and track teams as well as being the current ASB Commissioner of Pep and Athletics. We would like everyone that runs to pay at least $5 but major donations are accepted and are tax-deductible (Make checks payable to North Monterey County HS). 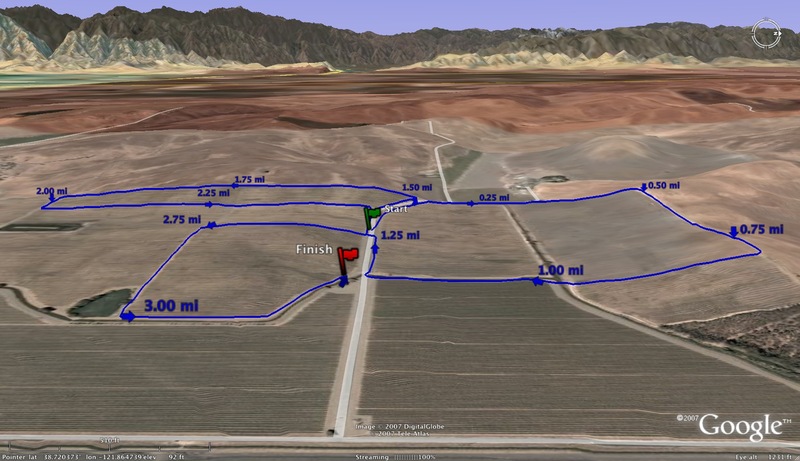 A waiver and run flyer is posted here http://nmcxc.tripod.com/id113.html. I've also attached the race flyer in various formats to this e-mail. Please contact and forward this e-mail to anyone that knows any of the Trujillo family members and encourage everyone you know to come and run, cheer, and support this great family. We would especially like to welcome the children from Bardin Elementary where Elia taught and the Trujillo family and children that will be running along with us to honor Elia. Today we chat with Marin Catholic's junior, Theresa Devine, who is coming off a highly successful season which included an NCS individual title and a top 10 finish at the state meet in Division IV. Theresa is no stranger to the front pack at the NCS meet as she had two 4th place finishes in her first 2 years in the sport. She has also nicely improved her place at the state meet with a 30th place finish as a 9th grader, 15th place finish during her 10th grade year and a 5th place finish this past season. 1) How did you get your start in distance running? I ran cross country in middle school in order to stay in shape for soccer. I've been playing competitive club soccer since I was 8. When my teammate Alec suggested that I start cross country in high school I thought it would be a good opportunity to get to know new people while staying in shape. By the winter of my sophmore year I decided to train year-round (or as close to it as possible). My coach Daryl really showed me how much potential I have and how rewarding running can be. 2) What other sports have you played or currently play besides cross country? When I was very young (elementary years) I used to swim and play baseball as well as play soccer and basketball. Up until this year soccer and basketball ran my life while running was an afterthought. Just last winter I played varsity basketball and varsity soccer for my high school. I realize now that I enjoy running more and love training on the trails in Marin. 3) When you were starting running, what runners inspired or challenged you to become a better runner? When I first started I really looked up to the more experienced teammates on my team. I aspired to be as fast as Alec and as dedicated as my former teammate Natalee. This year my new coach Mary has been a true inspiration as she has taught me to treat running as a life-long endeavor. 4) During your 9th and 10th grade seasons in cross country, you finished in 4th place at the NCS meet. This year you finished in 1st place with a considerably faster time. What do you think are the reasons for your improvement this year? After last season I decided to keep up my long runs through winter and spring as much as possible. 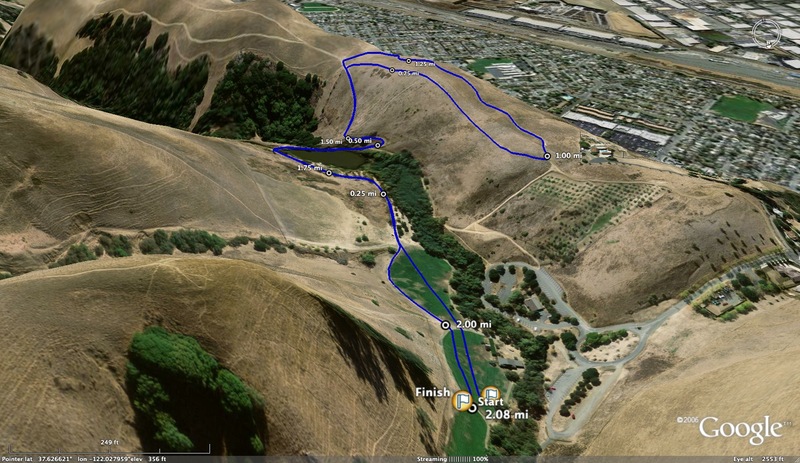 Then during the summer I ran on many of the best trails Marin has to offer. I think being in better shape gave me confidence as well as fitness. 5) Looking back at this past season, what do you think was your best race and why? I am really happy with the way the season panned out in general, but I do feel I peaked well by the time state came around. I think I just ran intelligently and followed the "plan" even though I felt a lot of nerves and pressure going into it. 6) Tell us a little about your coach and what he has meant to you in terms of your running? Coach Daryl essentially brought me into the running world. Before he came I knew little to nothing about training or racing. I just ran hard for the five days a week we had training and played soccer on the weekends. Without his guidance and training I would have never made the leaps I did this year or overcome the adversity I faced. 7) What was your goal going into the state meet in terms of time and place and did you meet them? Going into state meet I had a goal of running 5:50 pace, but I realize I set the bar high. I really didn't want to have a goal to fall back on. I wanted to be able to run free from expectation and look to either winning or simply running my best race. 8) What was your position during the first mile? 2nd mile? 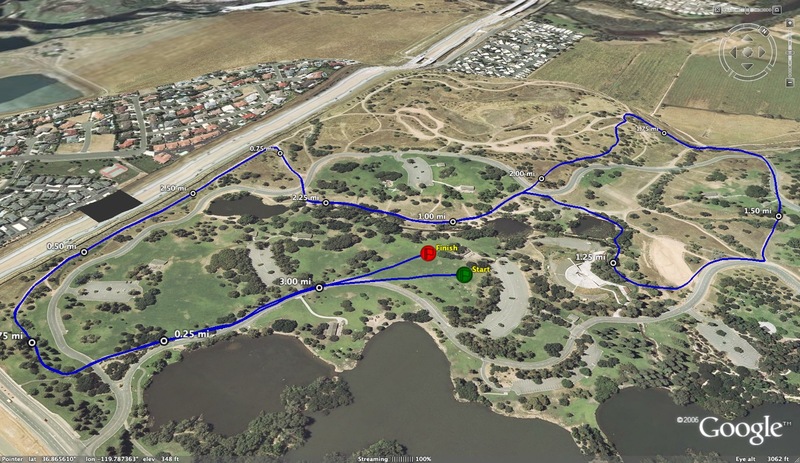 Toughest part of the course? At the first mile I was near the front of the second pack as a conservative start. Then by the second mile I had taken some control of the chase pack. By then what I considered the worst of the course was over. It wasn't a matter of difficulty, but a matter of strategy. At NCS I went out really hard and I knew that if I wanted to do well at state I would have to run with a little more intelligence. I was happy with my result and I am looking ahead for faster times next year. 9) What did a typical week look like for you in terms of mileage and workouts? Our mileage varied from week to week and I can't say I exactly know the numbers. I do knew, however, that we tapered down before the last few weeks of season. During the early going, we had anywhere from 3-4 quality days of workouts that ranged from hill training to fartlek to tempos and even some time trials. We mainly worked in phases to build strength and then develop speed. 10) I know you have done soccer in the past during the spring. What are your plans for this coming spring season? I plan on running track for this upcoming spring. Through the help of my coaches, teammates, and family I have made the executive decision to focus on running. I really enjoy running and am looking forward to track season. 11) Now that you have three years of cross country experience, what would be your best advice for a beginning runner who is eager to improve? My advice for a beginning runner would be to have patience. The key to improving seems to be running hard and resting well. I wouldn't get too stressed either. Learn to enjoy running and working out and the success will come. I really owe a lot of thanks to my coaches. Everyday they are out there encouraging the team and coming up with training plans. They are really a special crew. 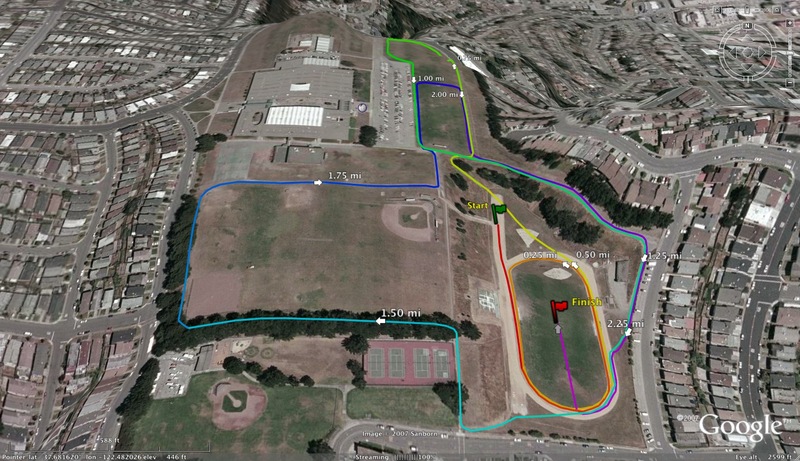 The 9th Annual San Rafael Twilight Relays will be held on Saturday, March 14, 2009 @ San Rafael HS. We will continue to be on our traditional date -- the 2nd Saturday in March -- for planning purposes and in deference to the Skyline Invite (1st Saturday in March) and the Distance Fiesta (3rd Saturday in March) since we often draw a similar slate of schools. 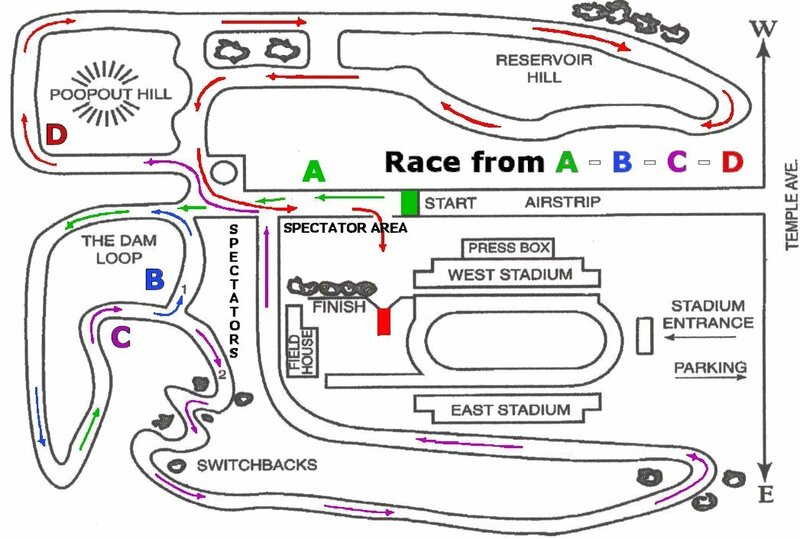 As always, we will have a full array of exciting relay races, with beginner to elite heats, under the lights! We pride ourselves in putting on a great athlete and spectator friendly and exciting meet! I hope your team can attend! Entry Fees: $10.00 per relay team. List race and estimated time of each relay team. Today we chat with the front runner for the Petaluma cross country team, senior Sterling Lockert. 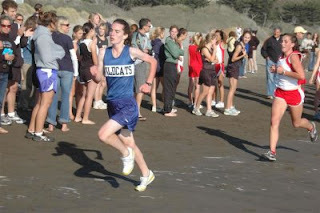 During his time on the Petaluma team, Sterling has led the team to 2 NCS championships ('06 and '07), 2 podium finishes ('07 and '08) and many outstanding efforts at many cross country invitationals. Sterling has also been a state meet qualifier on the track in the 3200 (as a sophomore) and in the 1600 (as a junior). For those of you that don't know, Sterling also has a twin brother (Devin) who has also been a big part of Petaluma's success in cross country and in track and field in his favorite event, the 800m. 1) How did you and your brother get your start in distance running? I did Club XC when I was in fifth grade and lived in Washington. I was the worst runner there, even got last a few of the races. I didn't run again until the summer of my freshmen year. I got my dad race entries to the Angle Island 12k. I ran with him a few times before that. And went out to a few of the high school summer training runs. Other than that i didn't do anything. I went to the race and did pretty well. So I decided to run instead of play soccer. 2) What other sports have you played? Played soccer for six year. My friends mom (I had played soccer with him for 2 years) was the one that gave me to contact information to get a hold of Jim to figure out summer running and get on the team. 3) When did you turn your focus solely to running? The summer going into my Junior year was when I fully dedicated myself to running. Ran everyday. Paid more attention to how late I was staying up. 4) Looking back at this past season, what do you consider your best race? I think Clovis was a really good race for me. But I didn't feel that this year I had a performance that was obviously my best race. I feel like I ran how I was expected but never really exceeded that. 5) Favorite course? Favorite invitational? Favorite runner(s) to race? Favorite course is either Woodward, Spring Lake, or the Mariner course. My favorite invite is either Stanford or Clovis cause I love the atmosphere of all the runners. I love looking around and seeing the best teams in the state. 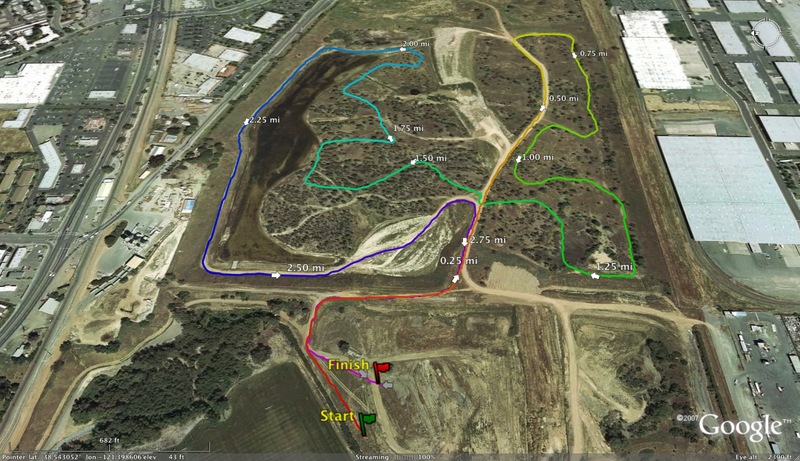 I like Clovis because it's fun to get to run on that state course without any pressure to preform well. I sort of like racing my brother. Other than that I don't really have a kid that I get excited to race. 6) Tell us a little about the state meet race. What was your strategy going into the race? Well, with it being my senior year I wanted to make sure I left nothing out there. The 4:32 (or something like that) made sure I didn't do that. I mainly wanted to run with the leaders and try and move at the mile. My only strategy was to run with guts and heart, I might have done better if I'd ran with some brains, but that wasn't what that race was about for me. 7) What was your favorite workout during cross country? How long was your longest run? I love long runs. I think hill repeats are probably my favorite workout. Or maybe track work...I have no idea what my favorite is. I like it all. My favorite workout is running. Longest run I think was 16 miles. That was over the summer. My most memorable run was a 14 mile Bjorn, Cole, Cody and I did out at Pt. Reyes. 8) Looking ahead to the track and field season, what is your favorite distance in track? Favorite relay event? Favorite invitational in track? I like all the distances. My favorite is probably the 3200. I like that extended pain. It also is long enough where my kick doesn't get sucked out. Favorite relay is the DMR. As for invites over the track season, I really like night meets. I enjoy Stanford a lot. Skyline distance fiesta was really, really fun with the music and night running. 9) What runners inspired you when you were first starting out in the sport? How about now? The usual inspired me as runner. Pre and Alan Webb are the first ones to come to mind. Chris Schwartz is pretty inspiring as well as Mac Fleet. They are both really nice kids and, obviously, amazing runners. German Fernandez also inspires me. Finally, my team. They're the biggest inspiration. 10) Looking back at your four years of Petaluma cross country, what do you feel was the best accomplishment by your team? I think that our best accomplishment was Nike Team Nationals. I know that as a team, that was the most fun we have ever had. It's also something that we did well at. Of all my running memories that one is the one I'll remember most vividly. 11) I have seen this question before but where do you see yourself in ten years? Thanks for taking the time to send this. Thanks for keeping up with the running world. Thanks Jim for being such and outstanding coach. Thanks Carla for coming out and helping us become nice and flexible. Thanks Mrs. Teeter for giving up time to run our practices. Thanks to Courtney Raffaelli for inspiring me. Thanks to our amazing girls team who are the most supportive girls team ever. And thanks for all the guys on the team (Brandon, Devin, Cody Forest, Hugh, and Ben) for giving up so much to the team. *que academy awards music* And thanks to everyone that's made Cross Country such an amazing experience. 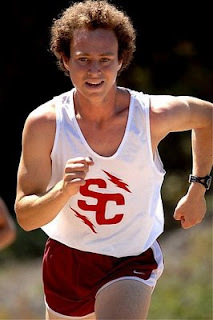 Today we chat with former Barstow and current Chico State runner, Anthony Solis. Barstow won their fourth straight state championship this year running their championship total to six. Three of those championships were with Solis as one of the key cogs on one of the best teams in the history of CA cross country. The coach in charge of all the success, Jim Duarte, just recently retired so I asked Anthony to tell us a bit about his HS coach. Solis is now continuing his running at Chico State, one of the best division II distance schools in the nation. The picture on the left is during the 2007 CIF-SS prelims as Solis gives the thumbs up following poop out hill. Well what got me started was my dad who ran a 15:00 at Mt.Sac in the early 80's in high school and I always like to be the better one in the family at everything. So my freshman year I went out for the xc team at Barstow and just enjoyed the atmosphere that I was around. 2) Did you know about the quality of the Barstow Cross Country team before you attended the school? When I first moved to Barstow at the end of 8th grade I had no idea that the team has had the tradition that they've had(i.e. winning state in 2001 &2002) before I actually was on the team. 3) When did you start to feel like you belonged with some of the top runners in the state during HS? I actually started my sophmore year just dreaming up to be the top guy at state my senior year. I steadily moved taking 86th my sophmore year, 17th my junior year and then 3rd my senior year in Div.3 I didn't actually believe it till my junior winter training when Coach Duarte gave me a lecture about how next year I was the leader. 4) Why do you think Coach Duarte was so successful during his time at Barstow? I just think that he related well with his athletes. He was a great Coach who wanted each and every one of his athletes to sacrifice things to make themselves and the team better. And you know what it actually worked bcause our team has sacrificed so many things for Barstow Xc to be how they've been. I'm just thankful that I was able to be coached by Duarte. 5) What did a typical week look like for you in high school during your senior season? During my senior summer I averaged between 55 and 65 miles a week where I hit one 80 mile week which mmade me feel as strong as I've ever been. Thenn I maintained like 55-60 miles all the way until CIF prelims where I went down to about 45 then went down a little more for finals and State. 6) Why do you think Barstow peaked so well during the most important meets at the end of the season? Duarte taught us to never really race all-out at an invite or at a dual meet. We always raced in our training shoes until CIF-SS Finals where we "busted" out our flats and really started to race. 7) Looking back at your high school career, what accomplishment(s) are you most proud of? The thing I'm most proud of is being a part of 3 State Championship teams and leading Barstow to it my senior year(2007). I say that made me way more proud than being Individual CIF-SS champ in Cross Country and the 3200m my senior year because I had teammates who were there to celebrate with. 8) What workouts did you do during cross country that helped you excel as a runner in HS? I would have to say my long runs on Sundays are what got me to excel the most in HS because they made me feel physically and mentally stronger than the previous week. 9) Any similarities between the Barstow team and the Chico team? There are a few similarities. First I would have to say that both my Barstow and Chico teams are all really close to each other and all good friends. Second would be that in Barstow I did high mileage for an aveage high schooler so that helped me adjust to Chico's mileage program. Last I would have to say that I had a great Coach under Duarte and now I'm under another great Coach with Gary Towne. 10) Now that you have run for a few months in college, what could you have done differently in high school to help ease your transition into college? Well I could've actually got serious my freshman, sophomore, or junior year to make my senior year even more exciting than it already was for me. I never really trained hard until senior summer when I actually wanted to train to be remembered. 11) What would be your advice to any high school runner who has dreams of being among the best runners in CA? I would just have to say don't doubt yyourself at any time because that can make the difference of you actually putting everything you have into it and just being just another average runner out there who just wants to qualify to the state meet and not actually dream of winning it. So just set goals for yourself and train hard and you'll find out that it all pays off in the end. I would just like to say thanks for this interview and to everyone out there go buy the new Kanye West 808's & Heartbreaks cd....that's another thing that motivates me is Kanye's music. Thank you very much Anthony. AJC. The first interview is with former San Mateo HS, U. of Arizona and 1996 Olympian in the 5000m., Matt Giusto. He was the winner of the 1993 Kinney (before it became Footlocker) national championship race in San Diego. Giusto had finished 3rd at the Western Regional and upset several of the favorites to win the title. On a side note, I was a freshman in the same league (not caliber of runner believe me) as Giusto when he was a senior and I am sure he lapped me a few times in the 3200 . I can say I only got lapped by the best! The second interview is with the original Jordan Hasay, former Santa Rosa HS and Stanford runner Julia Stamps. The reason I compare her to Jordan Hasay is because Stamps was also a dominant runner in the middle school who continued her spectacular running in high school. She was also the one to beat in any race she entered. The third runner interviewed is Sara (Bei) Hall who is still competing at a very high level to this day. She ran at Montgomery HS and yet another Jordan Hasay comparison, she is the only runner in CA state history to win a cross country title in each of her four years in high school. Hall went on to compete at Stanford University and is still one of the best 1500m. runners in the United States. She also married some random guy (ha!) who happens to also be a pretty fair runner himself as well as a former national champion. His interview is linked below. 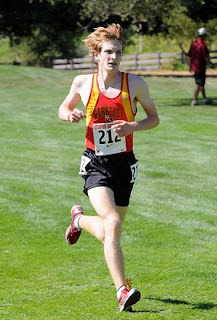 Today we chat with Davis High senior runner, Matt Petersen. At the state cross country meet, Matt finished in 7th place in the highly competitive Division I race as he recorded one of the fastest times for a Northern California runner, 15:17. An outstanding effort for latest star on the Davis High cross country team, one of the juggernauts in the San Joaquin Section (SJS). How dominant is the Davis team in the SJS? Try 7 straight SJS titles for the girls and 5 straight for the boys. 1) How did you get involved in the sport of Cross Country? 2) Who were runners (on your own team or other teams) you looked up to as you were first getting started in the sport? 3) There is no comparing Division I at the state meet to the SJS final or to any other section final for that matter. What race would you say prepared you best for the state meet? A mix between mt. Sac because of the competition and the fact that I knew I saw all who I would be racing, and sections because it gave me the confidence you need at the state meet. 4) What was your plan and/or strategy going into the state meet race? I knew there would be about 8 guys in contention to win, so I just hung with the pack and tried not to do a lot of the work. I found that I was still in contention at the 2 mile and from then on it is a gut race. I remembered it was the last shot I had at CIF cross country so I went for it. 5) How did the race unfold during the first mile? During the first mile, things shook out almost just the way I thought they would, all the players were there and I just fell in to place and relaxed. I didn't check my time at the mile on purpose to just focus on the place. 6) Did your position change during the 2nd mile? I pretty much hung at about 5th place for the whole 2nd mile. I made sure to push both the down and maintain and not give ground on the up. 7) What about the third mile? As I expected, Sanchez moved up at the end of the two so I latched on to him but he gapped me a bit and then went on to get third. Thinking back that was probably my only mistake not to press harder there to stay with him. I had a really good final push with Danny from Buchanan in the final 8 though. 8) Now that you have had some time to reflect back to the race, how do you feel about your time and place? I am thrilled with the time, like I said before, if I went with Sanchez I think I could have placed higher. 9) Tell us a little about your coach Bill Gregg and what he has meant to your own success and the success of the Davis team? I cannot say enough about Bill. He has built this team from the ground up and has got together something special that will last for a while. The atmosphere is unlike anything else I have experienced. As for my own personal fitness, I owe so much of it to Bil and this was possible because of him. I couldn't have hand picked a better coach. 10) What workouts did you do during the season that you feel gave you confidence to compete with some of the best runners in the state? Bill's training has prepared me for so many aspects of running. He has trained my speed, my threshold, and my vo2 max. I think the most preparing workout for me however, would be my threshold days, although vo2 max is just as important. I say threshold because, on a personal level, that is where I have made the greatest improvement this year and it shows. 11) Looking ahead to track season, what event will you focus on and what races are you looking forward to that you have done in the past? Well I don't want to look to far past footlocker, but for track I will focus on the 3200 although I need to bring down my mile PR, but that will hopefully be done in a lower key meet or maybe the second day of Stanford. I am looking forward to Stanford, Arcadia, and then State meet (surprise surprise). I haven't raced at the state track meet yet so I'm excited to see what that is like. It has been a great cross country ride and I am sad I will no longer be representing Davis on the cross country course. Today we hear from Josh MacDonald of Redwood Christian who recently finished in 7th place in the Division V race at the state meet. 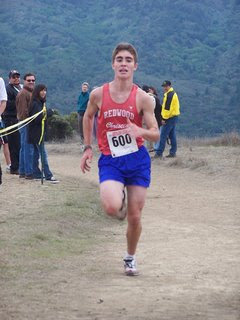 He led his team to a very strong 5th place finish at the state meet, the highest recorded finish for Redwood Christian. Josh also finished in 2nd place at the NCS cross country meet. With this year's winner (Steven Inglehart of Branson) graduating, Josh will have the rare opportunity to win a CCS individual title (seen here to the left winning last year's race as a sophomore) and an NCS individual title (perhaps next year?). 1) How did you get interested in running cross country? During my 8th grade year I started running the mile on Fridays in PE. My PE teacher Mr. Warner encouraged me to improve my mile time every week. At the end of the year, I ran in a middle school track meet at James Logan High and ended up with a 5:20 mile. After that meet, Coach Warner told me if I worked hard during the summer, I could do well in cross country. Before school ended, he gave me a training program to follow so I would be ready for the first practice. 2) When did you first realize that this could be a good sport for you? Two things helped me realize cross country would be my sport – First, I won the first cross country race I’d ever been in. It was the frosh/soph race at the Farmer Invite. This motivated me to train harder and learn more about running. Secondly, when I qualified for state as a freshman, it was the highest accomplishment I had ever achieved in any sport. At this point running became a passion. 3) You were the CCS Division V champion last year and finished in 2nd place at the NCS meet this year. What have been the biggest changes for you and your team in terms of switching leagues and sections? The biggest change for us was getting to know the competition and the courses. In the PSAL we ran against some good teams like King’s Academy and Sacred Heart Prep and individual athletes, like Robbie Knorr, the 2006 DV state champion. This prepared us to run against the type of quality competition we have faced in the BCL and NCS. 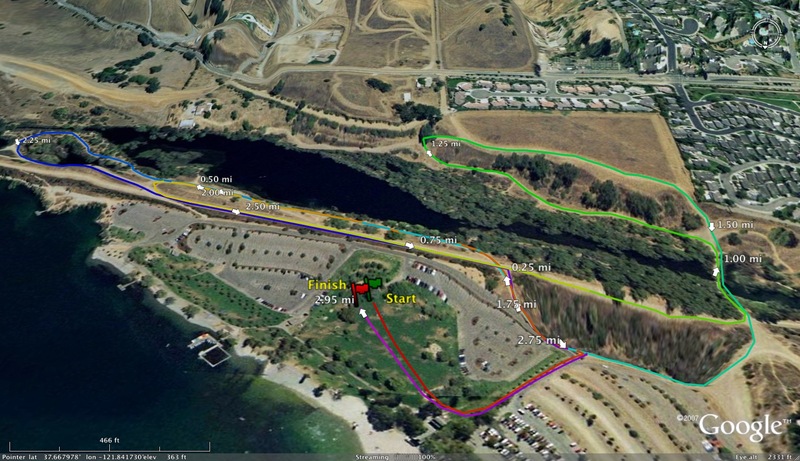 4) What was your experience on the Woodward Park course for you prior to the state meet? I have only run at Woodward two times prior to this year (both at the state finals). 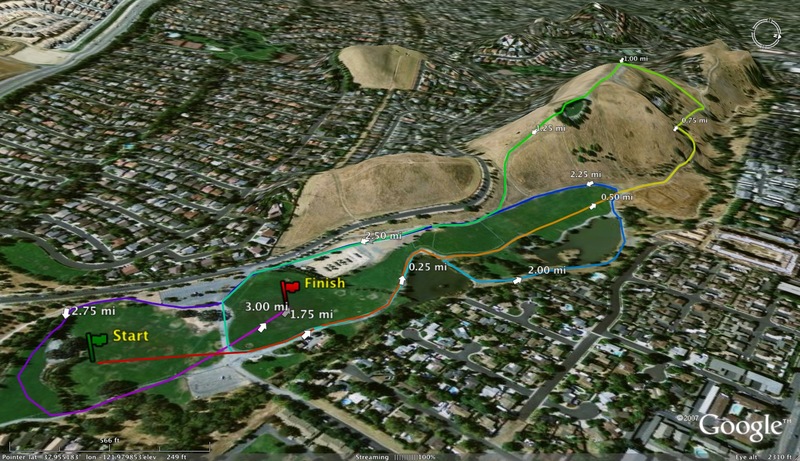 I know it is a fast course that favors athletes who run well on flatter courses. 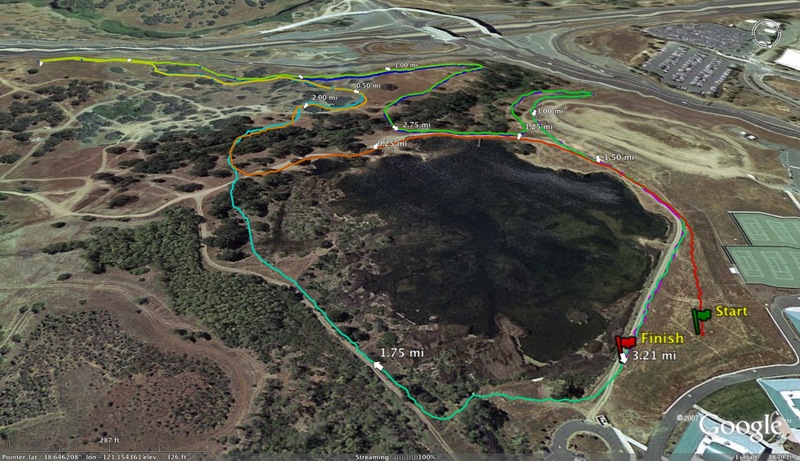 I prefer the hillier courses like Crystal Springs, Canyon in Castro Valley, Joaquin Miller and Garin Park. 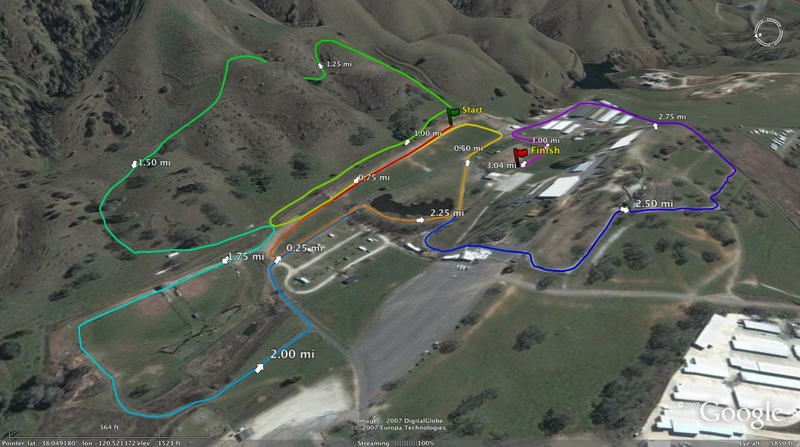 These courses have the type of terrain I like racing on. 5) What was your race plan going into the state meet race? My plan was to go out slower than I normally do, stay with the leaders through the second mile and hang on to the end. As a team our goal was to break the Redwood Christian record of 7th place set in 2003. 6) Tell us a little how the race unfolded through the first mile. The leaders went out a little slower than I expected, putting me near the lead a little before the mile mark. I felt really strong at the mile but did not feel that I had found my rhythm. 7) What was the toughest part of the course for you? The toughest part of the course was the last tenth of a mile because I have no kick whatsoever. 8) Now that you have had a chance to reflect on your state meet effort, how do you feel about your place and time? Right after the race I thought about several little areas for improvement. I would have liked to break 16 minutes and finish in the top 5 but that will have to wait. That being said, I felt the bigger goal was the team goal of 6th place or better which we accomplished. 9) What was the best part of the whole state meet experience? I liked hanging out with my teammates, enjoying ourselves and not worrying about the race. The team and our families went out for dinner, and then we bowled and played cards later that evening. Eating In n Out Burger after the race to celebrate our 5th place finish was the cherry on top. 10) Looking ahead to the track and field season. 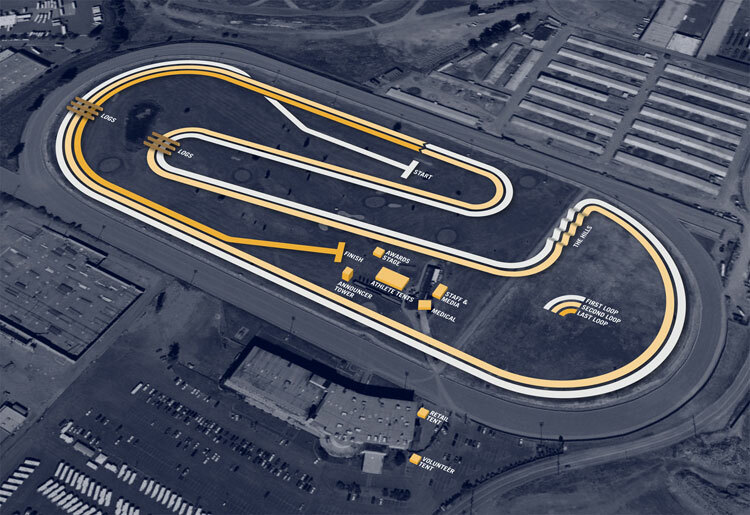 What do you consider your best distance on the track? Favorite meet? Competitor? The 3200m is my best event in high school track. However my best overall (and favorite) event is the 2000m steeplechase. I love the steeplechase because it is a guts race where you need a combination of speed, endurance and strength. I ran the steeplechase in the past two USATF Junior Olympics. Therefore my favorite meet is the Chabot Relays because they run a 2000m steeplechase. My greatest competitor in high school cross country and track is someone who I never had the chance to run against, Jack Welch. Jack set the standard by which every runner at Redwood Christian is measured. 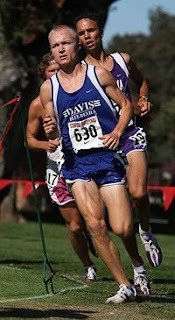 He holds Redwood’s distance records in the 400m, 800m, 1600m, and 3200m. One of his classmates sent me a message yesterday that refers to the years that Jack ran as the “Golden Age” of Redwood cross country and distance running. Beyond his records, we are measured by his outstanding character as an athlete. I’m glad I got to know more about him from Coach Gillette, his sister’s Jo (who was on our coaching staff this year) and Christina (who was a big help to me my freshman year). 11) Now that you are a grizzled veteran, what would be your advice to somebody just starting out in cross country? Prepare yourself for cross country by putting in mileage that you can handle over the summer. To be successful, cross country should not start on the first day of practice. It’s been fun running for Coach Gillette. He’s an underrated coach who doesn’t get the recognition he deserves. He looks for ways to encourage and motivate each and every runner on the team to do their best. Although we are a small school, that often has small cross country teams, Coach Gillette has had 37 different athletes qualify to the state championships in his 24 years of coaching. I’d also like to thank you for the interview. Contact Chris Puppione (cvpuppione@yahoo.com) for register for the event, as well as to receive further information. Please contact Chris ASAP as spots are filling up fast. Some of the best coaches in SJS, NCS and CCS will be at this Round Table. Don't miss out. ADDITIONAL INFORMATION ABOUT THE ROUND TABLE. KEEP READING! Now that cross country season is in the books and the track & field season looms on the not-so-distant horizon, we would like to invite you to join us for a clinic unlike any other in the state of California. On January 3, 2009, we will be hosting The NorCal Distance Coaches Collaborative Round Table in Walnut Creek, CA at The Sports Basement. The event is scheduled to kick-off at 9am and will be attended by many of the finest coaches from our part of the state. Sponsored by Sports Basement, Saucony, and CrossCountryExpress.Com, this clinic is unique in format and conception. Many of us have attended clinics over the years, and although we have been lucky enough to hear some great speakers, the part most of us look forward to is the aftermath—sitting around with your peers, swapping stories, discussing training ideas, asking questions, all while enjoying some good food and drink. We have decided to get rid of the lectures and ditch the conventional while getting straight to the good stuff—some high-energy shop talk with some of our sport’s finest coaches in a relaxed environment full of friends and soon-to-be friends. 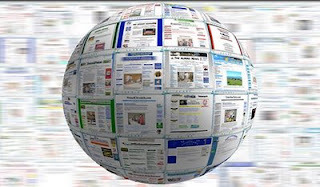 At this event, the attendees will choose the topics. Whether you want to rehash the last cross country season or talk about the track season ahead, you tell us and we will put it on the agenda. 1. Coaches are asked to email Chris Puppione (cvpuppione@yahoo.com) to sign-up for the event. i. This is an absolute necessity, as these suggestions will function as our agenda for the day. i. All coaches are expected to contribute with this—consider it your entrance fee! ii. These “nuggets” will be compiled and all attendees will receive the full collection of notes at the clinic. c. Any copies of your training plan or training notes from the past cross country season or the upcoming track season. i. While this is optional, coaches can submit these so that they may be shared with other attendees for review, critique, and to foster discussion of training methods. ii. By submitting your training ideas or plans in advance, we will be able to produce copies for review at the round table—you can have your season’s training impacted by some of our sport’s greatest coaches, so don’t miss out on this opportunity. 3. A running tally of coaches who commit to attending the round table will be maintained on Albert’s website (www.crosscountryexpress.com) so everyone can prepare any specific questions that they may have for their fellow coaches. 4. Prior to the event, Chris and Albert will release a schedule that will outline the topics for the day so that each coach attending may come prepared to participate and contribute. a. THERE ARE NO LECTURERS AT THIS EVENT. We are not presenting a seminar—this is an opportunity to expand the discussion and for everyone to be a student and a teacher. b. Attending coaches are encouraged to bring any information they wish to discuss or share to the event. We will have overhead projectors, LCD projectors, as well as AV equipment—bring it all. 5. Sign-in on January 3rd will begin at 8:30am with the round table beginning promptly at 9am. We will section the day into topics picked by our attendees, break for lunch at noon, and then reconvene for further discussion starting at 1pm. The round table ends when either you go home or they kick us out of the building at 3pm. These coaches will act as guides for the discussion, keeping the round table focused while moving the group through the agenda and moderating input from all coaches. They will offer their insights as well, but they are not clinicians or panelists. 8. After the actual round table event concludes, Chris and Albert will maintain the email list for all attendees so that the coaches who attend will be able to continue the conversations beyond the clinic walls. This will provide everyone with a constant flow of information and allow us all to become better coaches for our athletes. It is our belief that this collaborative round table will be of great benefit for all coaches—rookies and veterans alike. Please join us for this amazing event by emailing your registration to Chris Puppione (cvpuppione@yahoo.com). Be a part of the excitement—be a part of the conversation. 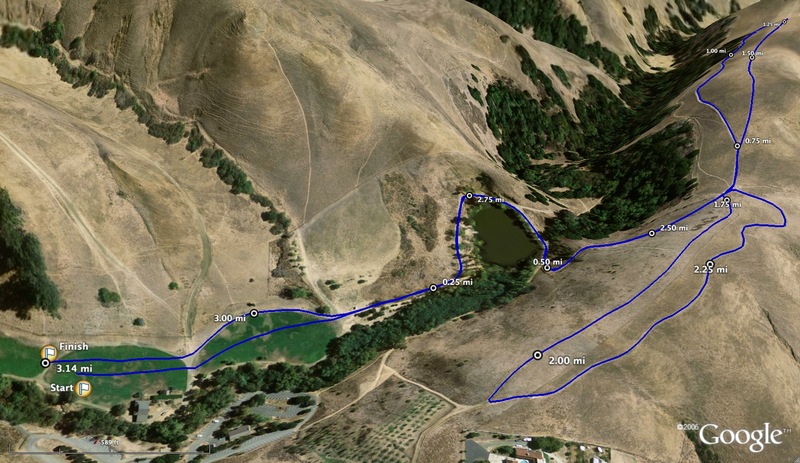 Join us January 3, 2009 at The Sports Basement in Walnut Creek, CA for The NorCal Distance Coaches’ Collaborative Round Table. Today we chat with the 2nd place finisher in the Division IV race from this past Saturday's CA state meet, Santa Cruz's Brennan Lynch. He shot out of the gate fast this year with an impressive victory at the Earlybird Invitational over Cody Schmidt of Redondo Union. He followed that with outstanding efforts during the rest of the invitational season and league finals. At the CCS meet in Toro Park, Brennan finished in 2nd place behind eventual state champion, Tyre Johnson of Palma. 1) How did you get started in running cross country? My dad was always a runner, and he suggested to give cross country a shot. So I tried it out and it soon became a part of me. 2) When did you first realize that this can be a good sport for you? I realized running was suited for me by just being in a running atmosphere. 3) When you first got started in the sport, what runners did you consider as role models (on your team or not). 4) Before this season, what did you consider your best accomplishment in xc? Before this XC season start my best accomplishment from last year's XC season was placing 7th in state. 5) Tell us a little about your summer training and what you did differently this year than previous summers? The main difference of this summers training from previous summers was an increase in mileage and quality. 6) What were some of your goals going into the season? My main goal going into this cross country season was to have a lot of big PRs. I also always had placing in the top three at state in the back of my mind. 7) What was your plan going into state meet race? My goals for state were to run smart and strong with a plan and to let the results take care of themselves. 8) How did the race unfold and where were you through the first mile? 2nd mile? 3rd mile? The leader (Tyre) took it out in 4:40 and many followed. I tried to hold back and not go to crazy. I found myself in tenth place @ 4:52. Over the next mile I move up a few places to eigth, 15 seconds behind the leader. Between mile 2 and 3.1 I passed several others and found myself in a pack of four chasing the leader who was 10 sec. ahead. With 200 meters to go I outkicked the pack and came in 2nd, four seconds back. My time was 15:36, a 35 sec. PR from last year. 9) Favorite race? Favorite course? Favorite competitor(s)? My favorite course is Crystal Springs. I love racing against people who are not afraid to push the pace and are competitive. 10) Looking ahead to track and field, what do you consider your best distance in track? Who are going to be your biggest challengers in terms of making the state meet in track? I'm not sure what event I will be focusing on in track. Probably the 1600 or 3200. CCS is filled with tons of talent and I'm sure I will have many challengers. So we will have to see how it plays out. 11) What would be your best advice to a young runner who wants to take their runner to the next level? Be dedicated, work hard, be comfortable with being uncomfortable and follow your highest aspirations. Division I Boys Race 8:32 a.m.
Division II Boys Race 8:59 a.m.
Division I Girls Race 10:29 a.m.
Division II Girls Race 10:06 a.m.
Division III Boys Race 10:42 a.m.
Division IV Girls Race 11:10 a.m.
Division V Boys Race 11:45 a.m.
Division III Girls Race 12:16 p.m.
Division IV Boys Race 12:51 p.m.
Division V Girls Race 1:21 p.m.